Today is our final recipe in the Cooking Light Ground Beef series. 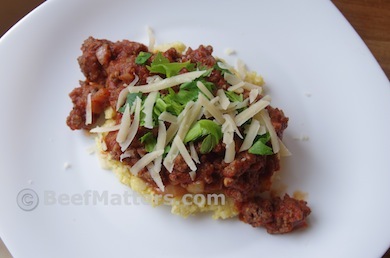 I served Italian-Style Beef with Polenta to my family last evening. My family really enjoyed this dish. The meat sauce is simple and delicious. Choosing a good marinara sauce will make a big difference. Cooking Light recommends McCutcheon’s. Use what you and your family enjoy. Haven’t tried polenta? No worries! It takes a little time, about twenty minutes, and a lot of stirring, but is really quite simple to prepare. 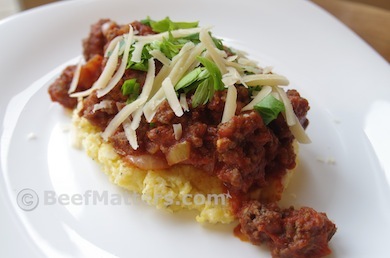 I liked that this recipe adds oregano to the polenta and my kids loved that it was cheesy! Polenta is a nice change of pace from the usual pasta with meat sauce. Give it a try! Heat a nonstick skillet over medium-high heat; coat with cooking spray. Add beef; sauté 5 minutes. Stir to crumble. Remove beef; drain. Wipe pan; coat with cooking spray. Add onion, pepper, 1/8 tsp. salt, and garlic; sauté for 4 minutes, stirring frequently. Add beef and sauce; simmer 8 minutes.